Banana Oat Pancakes are the best gluten free pancakes ever! 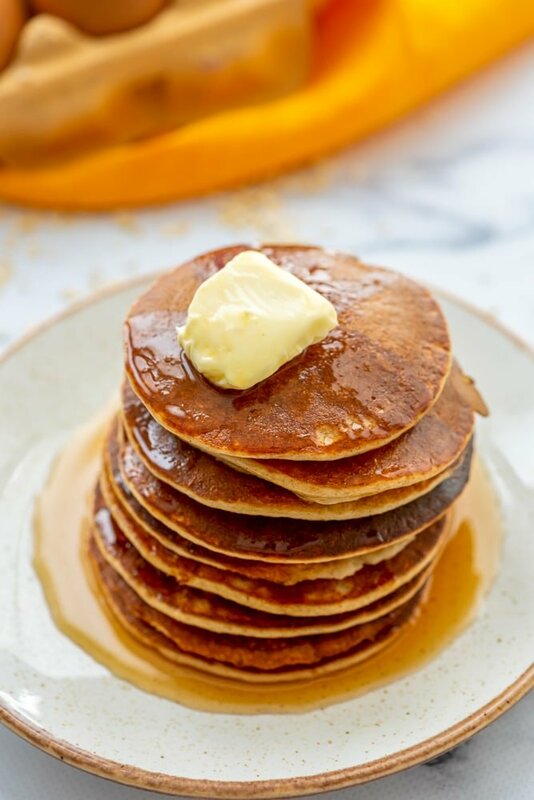 Simple ingredients are blended together to create fluffy and naturally sweet, gluten-free banana oatmeal pancakes that are absolutely irresistible! 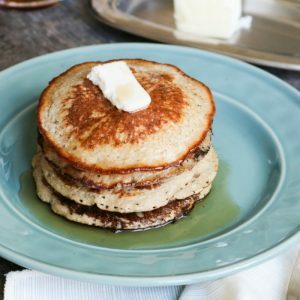 If you love these Banana Oatmeal Pancakes, you may also Gluten Free Cinnamon Muffins, Gluten Free Breakfast Casserole, and Oven Baked Frittata. I have no need to be gluten free, in fact I love my carbs. I could live on a whole wheat bread and pasta. But I know so many people for various reasons have to cut the gluten out. And frankly, as much as I love carbs, I do think it is very important to eat a variety of foods in order to maximize nutrients. Gluten-Free Oats are my go-to for creating delicious gluten-free oats recipes. So onto gluten-free pancakes, because, well these Banana Oat Pancakes are incredible. These healthy banana pancakes are light, fluffy, and perfectly sweet. They come together in the blender and are easy enough for weekday breakfasts. BONUS: Banana Oatmeal Pancakes couldn’t be any easy or cheaper to make!!! What?! Gluten-free that doesn’t require crazy flours or stabilizers–this is too good to be true. 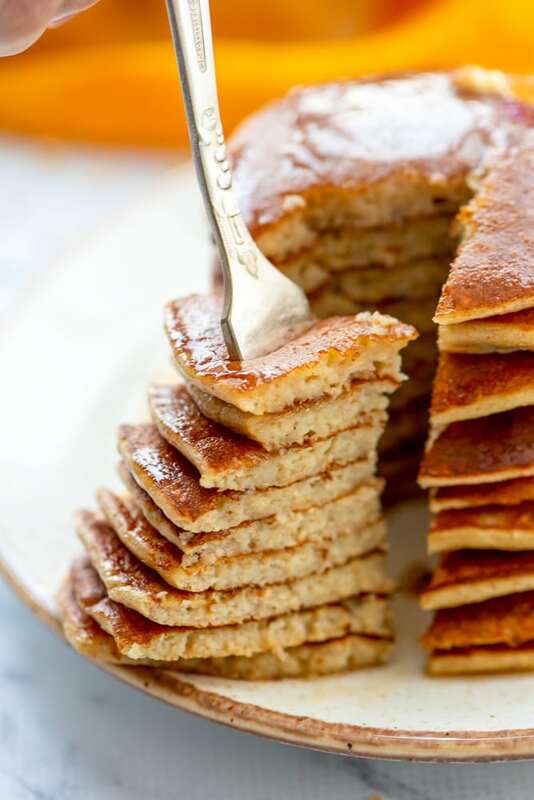 There are many versions of blender pancakes floating around on the web but this is the recipe for Banana Oat Pancakes that I have tweaked and found to come out perfect every time!! These Healthy Banana Pancakes are delicious topped with a bit of pure maple syrup or simply fresh sliced fruit. I enjoyed them the last time I made them with blackberries and sliced bananas–heavenly! Because you are blending the oats, you can easily use old-fashioned oats or quick-cooking oats–just not steel cut oats. The riper the bananas, the sweeter the oat pancakes will be naturally. You can use any variety of milk–therefore, they are easily made to be dairy-free banana oat pancakes. I often use frozen bananas. I just heat the frozen bananas up in the microwave for a minute or two and then cool slightly so as not to scramble the eggs when added to the blender. These banana pancakes are perfectly sweet. They are absolutely perfect with a smear of peanut butter or other nut butter of choice. Peanut Butter and Jelly Blender Pancakes. Simple ingredients are blended together to create fluffy and naturally sweet, gluten-free banana oatmeal pancakes. Preheat a greased skillet/griddler to medium heat. Dump everything into your blender and give it a whirl until everything is combined and oats are blended well. I like these pancakes thicker, but feel free to add a bit more liquid if desired. Pour about 1/4 cup of batter onto skillet and cook until small bubbles form, about 4 minutes. Flip and cook 2-4 minutes a side. Top with your favorite pancake toppings and enjoy!!! Yum! I’m Going To Make These Tomorrow! Wow !! I should try this ! Sounds delicious. Thank you for linking at Bloggers Brags . I have pinned to Bloggers Brags Pinterest board. We would love to see you today at the party. Thanks Sahana! The pancakes are so easy it is unbelievable! You really couldn’t get any easier than this recipe. Although I don’t need to eat gluten-free, this is a great option when I have house guests who do. So easy! Great for busy mornings and/or gluten free guests. We are not gluten free either, but these are so delicious and easy, I will take them any morning. This is a go-to method of mine. Sometimes I use coconut instead of oats! I try to explain to my mother-in-law that her having Celiac doesn’t mean she is doomed to eat awful food for the rest of her life! I hope your mother in law knows how blessed she is to have you! You don’t have to eat awful food or expensive food and can still manage wheat allergies/celiac disease!! Blender pancakes, what a lovely idea! Thanks for sharing! YUM! These sound delicious! I’m always looking for quick and easy pancake recipes – not to mention healthy ones! I love that these are made with oats and bananas. 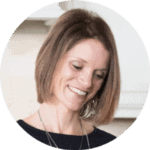 Thanks Jenna–these fit the bill for sure! These look so fluffy and delicious. Why have I never made pancake batter in the blender? It’s so easy! So much easier Joanie. Hope you give these a try! Peanut Butter makes everything better! I am actually getting ready to share my blender chocolate peanut butter cup pancake recipe soon! 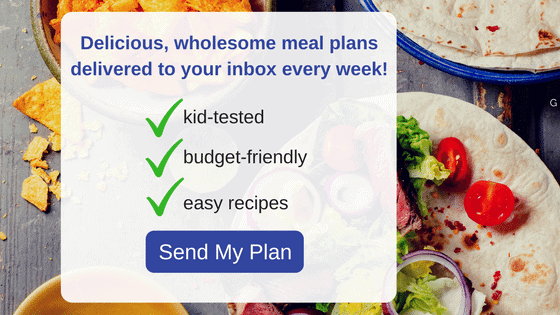 Thanks Krystal–I make them almost at least once a week for school! So loving these! I don’t need to cut my gluten either – but I do love oat pancakes – and adding bananas into the mix sounds wonderful! Shashi–I know you will LOVE these! These look SO good! And easy! Can’t wait to try them! Thank you Lane and Holly! They are easy and good! I hope you give them a try! 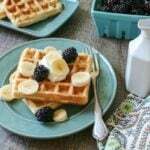 Love a quick and easy breakfast recipe! These look delicious! We’re not GF but like you I love to have GF recipes in my arsenal and these look fantastic! Such a great pancake recipe! My family is due for a big batch of pancakes and these will make everyone happy! So simple when you use a blender and I’m with you…yes, to the peanut butter! YAY!!! I am so glad your kids were able to start their day with these easy pancakes!!! Do you know how you could convert this into a waffle recipe? The pancakes are amazing though! Thank you! Hi Emily! I need to play around with making these into waffles. You would need a bit more oats and possibly some extra oil. Oh that makes me so happy Natasha, thank you for sharing.